We have five different types of sites; STANDARD, DELUXE, PREMIUM, PREMIUM PLUS and BIG RIG. The DELUXE sites consist of all “pull-thru” sites and are located closer to the Clubhouse and resort amenities. These sites have picnic tables and some of them have lawn. Deluxe sites are $5 more than a Standard. The PREMIUM sites consist of all “pull-thru” and “back-in” sites and are located closest to the Clubhouse and resort amenities. These sites also have lawn and picnic tables. Premium sites are $5 more than a Deluxe. The PREMIUM PLUS sites are beautiful back-in sites with decorative fencing, bar-b-q pits, and extended grassy areas. Premium Plus sites are $5 more than a Premium. All sites will be assigned at time of check in. All sites have 20, 30, and 50 amp service and free 28-channel cable line up. Oasis Las Vegas RV Resort honors Good Sam and FMCA discounts. Also, if you are looking for a great place to hold your rally, your search is over. 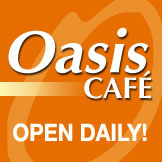 Oasis is the place! Our trained and helpful personnel can help to plan your rally festivities and make your rally an enjoyable and affordable event that you will never forget. Extra Guests - Oasis Las Vegas RV Resort will be charging $2.00 (two dollars) extra per person per day for occupants that are greater than four. Dump Station Fees - We have an onsite dump station which if free for Oasis guests. For non guests, the charge is $15. Cancellation Policy: If we do not receive a call from you by 12:00 noon on the day prior to your arrival date or you do not show up for your reservation, your credit card will be charged $60.00. 10% OFF OUR REGULAR DAILY RATES! Monthly rates are already discounted for your convenience. Above prices reflect the posted rates for this Resort, prior to any discounts, and do not include charges based upon additional persons or other conditions as they may apply. Holiday and weekend rates may vary slightly. To receive personalized planning for your requirements and discover which discounts apply to you, contact a Hospitality professional. We look forward to seeing you soon!